Al's Bonsai nursery in Jamestown. CA. Gift Certificates ... for bonsai workshop, bonsai care or bonsai purchases. Open 8 am - sunset daily. Accept Paypal; cash and check. ﻿Albert provides expert service, monthly, or periodically for bonsai diagnostics, pruning, care and instruction. Consider your bonsai that needs temporary respite / vacation care to have Al detail and restyle or renovate to a new or it's same pot. This is service available on sight or in the Tuolumne County region of Jamestown, Sonora, Columbia and surrounding communities. Free estimates. Spring time growth can become overwhelming. Let Al return your bonsai to its glorious beauty with a healthy glow. Albert has been a professional gardener since 1965, and has been self-employed for over 50 years. He has been privileged to offer professional horticultural services to clients throughout the San Francisco Bay Peninsula, as well as the Tuolumne County area. Albert now enjoys providing expert bonsai sales, service and care. Expert bonsai potting, shaping and pruning. Troubleshooting / evaluation of your bonsai. 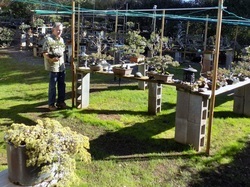 Albert has bonsai books, viewing stones, and so much more. They are available at our Jamestown address or online. Home Garden Service and Maintenance to fit your needs and budget. Weekly, once a month, every other week. On call basis for fruit tree pruning / quarterly clean up work. you begin with horticultural basics as Al outlines the potting, pruning and care of a bonsai. You work hands on to cut and prune roots and branches, finishing with touches of decorative stone and / or moss. Workshop classes may be scheduled weekly. (209) 536-1963. Various sizes. Limited quantities. ​ Advanced classes with Jin, Nebari wiring and larger trees are available. Enduring Beauty. Refreshing beauty one home at a time.